While the assembly of them took forever, this meal was pretty easy to make and turned out delicious. Please see the recipe and pictures from http://www.homechef.com (with adjustments made to the recipe by me) below the pics of my final product. Enjoy! Preheat oven to 200 degrees and prepare a baking sheet with foil. Thoroughly rinse produce and pat dry. Trim and thinly slice green onions at an angle (bias). 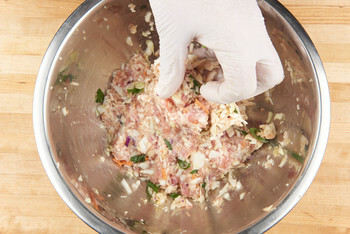 Mince slaw mix. A finer chop on the cabbage will make for a better filling. Core, seed, and mince Fresno chile. Set a small pot with rice, 2 cups of water and a nice pinch of salt on the stove – you’ll set it to boil once you’ve finished assembling the dumplings. 2 Tbsp. of soy sauce. Clear off a clean surface. Soak a clean kitchen towel and place it on a plate for moistening wrappers. Dampen a second clean kitchen towel for covering finished dumplings. Set out a small bowl of water to wet your fingers. Moisten one side of a dumpling wrapper on the wet towel and place on clean work surface, wet side up. Place 1 1/2 tsp. filling in middle of wrapper and fold edges together, sealing the filling inside. If wrappers need more moisture to seal, dip your finger in water and moisten edges. Press air out and squeeze edges together to form a tight seal. You may pleat the seal decoratively, but it’s not crucial. Making sure dumplings are tightly sealed is the priority. With seam facing up, press dumplings down on work surface to flatten bottom. 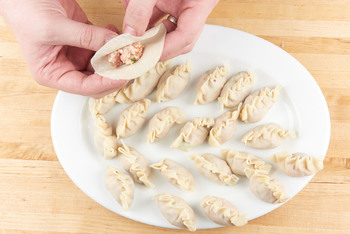 Set dumplings on a plate and cover with a damp cloth. Repeat until all filling is used (about 20-25 dumplings). Bring pot of rice and water to a boil, then reduce to a simmer, cover, and cook 18-20 minutes. Remove from heat and keep covered until serving. Heat 1 Tbsp. olive oil in a medium non-stick pan over medium-high heat. 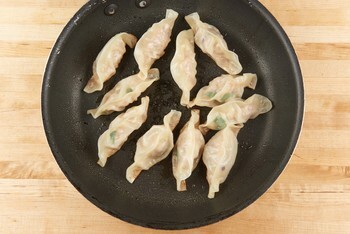 Place 8-10 dumplings in pan (do not crowd), flat side down. Cook 2-3 minutes, or until bottoms are golden brown. Add 1/3 cup water to pan, cover tightly, and cook 3-6 minutes or until a minimum internal temperature of 165 degrees is reached. Make the dipping sauce while the first batch is steaming. 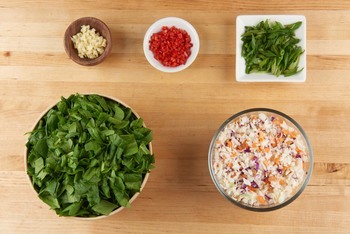 Whisk 4 Tbsp of soy sauce, 1 tsp of rice vinegar, 1/2 teaspoon sesame oil and half of the minced fresno chili to combine. Divide sauce into two portions for dipping. Wipe out same pan used for dumplings and heat 1 tsp. olive oil over high heat. Add remaining garlic, half the minced Fresno chiles, and remaining ginger to pan and cook 30 seconds. 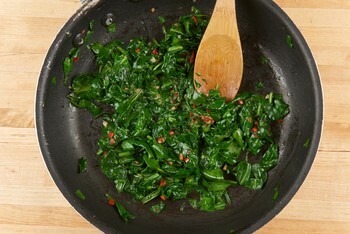 Add spinach and sesame oil to pan and cook 2-3 minutes, or until just wilted. Squeeze out excess water with tongs before plating. Place a portion of rice and spinach on a plate and arrange dumplings alongside. Add remaining Fresno chile (to taste) to remaining dipping sauce and serve on the side. Complete garnishing with remaining green onion.